Urn bearer was Luane Mickolichek. Interment was in St. Joseph Cemetery in Silver Lake. Raymond “Ray” Michael Jilek was born Sept. 29, 1924, in Rich Valley Township, McLeod County, to Frank and Frances (Bednar) Jilek. He was baptized as an infant and confirmed in his faith as a youth. He attended District 29 country school through the eighth grade, and graduated with the class of 1942 from Stevens Seminary in Glencoe. On Sept. 26, 1944, he was united in marriage to Alice Marie at St. Joseph Catholic Church (Holy Family) in Silver Lake. Their marriage was blessed with 10 children, Carol, Betty, Larry, Brad, Jim, Mick, Sandi, Mike, Steve and Kim. They shared over 71 years of marriage, and made their home in Glencoe and Cokato. 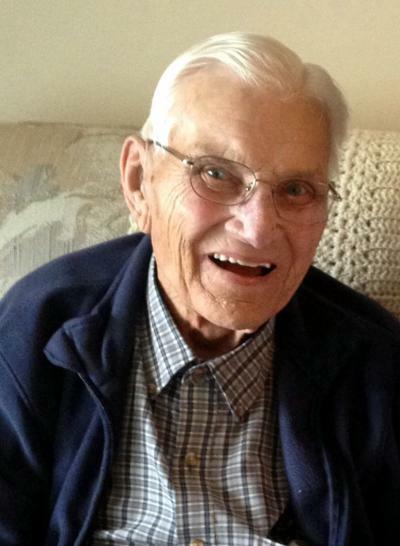 Mr. Jilek was a farmer and resided just north of Glencoe for over 25 years, raising crops, dairy cattle and other livestock to feed the family. Also, he was a substitute postal service mail carrier for over 20 years. He then went to work at Faribault Foods (Northland Canning), managing its field crop operations, and retired in 1988. He was an active member of the Church of St. Pius X in Glencoe, where he also was a member of the Knights of Columbus 3rd Degree. Mr. Jilek was a hardworking family man and committed husband who enjoyed gardening, traveling, reading, card playing, woodworking and household projects. He was a skilled “fix-it” guy. He was known for lending a hand to family, neighbors and friends. He made time for and made it a priority to spend time with his family and friends. He was a physically tough man who beat stomach and colon cancer when he was 66 years of age. He leaves behind a lasting legacy of perseverance, determination and putting family first. He is survived by his wife, Alice Jilek of Glencoe; children, Carol (Ray) Traen of Moneta, Virginia, Betty Hein of Henderson, Nevada, Larry (Carol) Jilek of Big Lake, Brad (Shelley) Jilek of Caledonia, Jim (Marlene) Jilek of North Mankato, Mick (and her husband Terry) Weir of Eden Prairie, Mike (Angela) Jilek of Wayzata, Steve (Brenda) Jilek of Bloomington and Kim Zierden of Minneapolis; 22 grandchildren, Julie, Greg, Jeff, Holly, Tricia, Sarah, Ben, Pat, Kristina, Bob, Erin, Anna, Kelly, Laura, Megan, Reid, Scott, Ashley, Mitch, Caroline, Samantha and Jon; 19 great-grandchildren, Jessie, Sarah, Lauren, Cailee, Jake, Jordan, Matthew, Jackson, Joey, Rio, Ally, Libby, Rylan, Hudson, Avery, Lucy, Jack, Liv and Luke Raymond; brother and sister-in-law, John and Rosie Jilek of Glencoe; half siblings, Mary Jo McKenzie of Shakopee and Jerry (Karen) Zajicek of Hutchinson; sister-in-law, Laurina Zajicek of Glencoe; nieces, nephews, other relatives and many friends. He was preceded in death by his father, Frank Jilek; stepfather and mother, Henry and Frances Zajicek; daughter, Sandi Wolff; half brothers Joseph Zajicek and Henry Zajicek; sister-in-law, Janet Zajicek; and brother-in-law, Allen McKenzie.